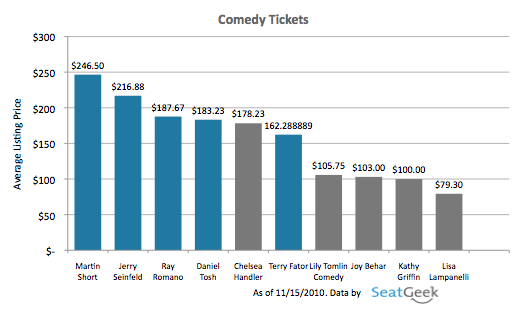 Digging deep into the SeatGeek archives, we have unearthed some interesting data about the relative prices of male and female comedians. It seems that the comedy world, for all its progressive humor, is still surprisingly gender segregated. We found that the top men demanded significantly higher ticket prices. Here are the average list prices for the top five men and women standup comedians on tour this year. Chelsea Handler, the most expensive female comedian, barely tops the guys’ number 5, Terry Fator, recent America’s Got Talent winner, while TV star Kathy Griffin and 2008 winner of the Best Comedy Album Grammy for “Dirty Girl” linger around $100. The average list price among the top five men is $199, compared to $113 for the women. Where does this difference come from? Does this data have any bearing on the dusty stereotype that men are funnier than women? No. The sobering $86 gender divide illustrated in this data is more likely an indicator of the number of women who pursue standup comedy as a career. Of the 72 comedians who sold tickets this year through SeatGeek, only 11 were women. This checks out with comedy talk shows as well. There’s Ellen Degeneres representing women, #10 on Forbes’ list of the world’s most powerful women 2010 (Handler clocked in at #33), but there’s a legion of men in the business–Jon Stewart, Stephen Colbert, David Letterman, and (where there should have been Conan O’Brien) Jay Leno, among others. Musing on the issue of what, other than $86 in list prices, separates these top-5 gender camps, SeatGeek came up empty handed. Interestingly, Handler and Griffin are both spokespeople for the LGBT movement, a serious side of their public persona that isn’t so visible among the top men, but this isn’t really significant. Whatever the cause, SeatGeek wants to see Sarah Silverman and Ellen Degeneres on tour because gender inequality is no joke, even if it is a common subject for male and female comedians.